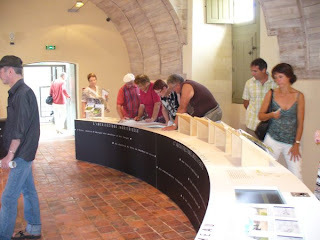 The new museum at the chateau of St Suzanne was opened this weekend. Since it was the inauguration, you could visit for free, and since there was a free choral concert on Sunday evening, the wife and I went on Sunday afternoon. Having taken the mick about bad promotions in my "Mayenne Muppets" post recently, I now have to give credit where it's due, and say that this new museum is excellent. The new Centre for the Study of Architecture and Heritage invites you to come and discover the heritage of the Mayenne in all its forms. Grand Opening 27/28 June, with illumination of the castle. 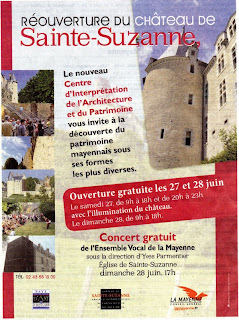 Free concert by the Vocal Ensemble of the Mayenne, directed by Yves Parmentier, Sunday at 5PM in the church." It is a museum of the Mayenne, covering the development of human habitation from cave man to modern times, and the natural landscape and flora and fauna of the area. The descriptions are comprehensive and also translated into good (not always perfect, but good) English. We also found an archive that features our gîte, from the earliest days when it was a working farm, that was fascinating. The original layout of the buildings, some pictures before the recent changes, were all there. An 1842 town plan, for example, shows some farm buildings, but does not have our house on it, but a later town plan does. And there were earlier references to a farm here going back to the 13th century. And the concert was wonderful! 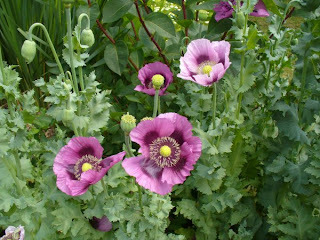 When I moved here, I discovered some annual Oriental Poppies in the garden. These self-seed like crazy, so every year they have re-appeared in patches somewhere around the place, and I tend to leave them be. That way, I get a bit of spontaneity in the garden. 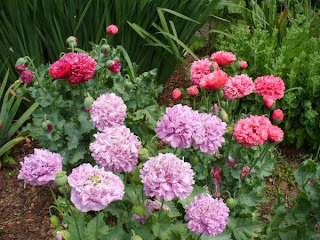 As with life, it's not a good idea to overplan a garden; you need to leave space for nice surprises. When they started they were all one colour, and double. This year, they have multiple shades of purple, orange, red and pink, and some are single rather than double. I play flute with my guitarist friend Alain once a week or so. In real life he is a dairy farmer. The market arrangements for milk in France are strange. He has a production quota that he is not allowed to exceed (he would get fined), he is only legally allowed to sell his milk production to a distributor, and the price he gets is fixed by the buyer. Alain has not seen an increase in the price he gets for milk in the 20 years he has been farming. If you have seen protests by French dairy farmers on the television, it is because it is being proposed that the price that farmers get be reduced by about 25%. His quota amounts to the average output of about 24-and-a-half cows, so to make sure he maximises his revenues, he has 25 cows. Every day, he pours away about half a cow's worth of milk in order to avoid the fine. The local cats love it, and because this happens in a small scale at every one of the thousands of small dairy farms in France, there is no "milk lake" for anyone to complain about. You can't get clotted cream in France, I have no idea why not. But there are plenty of recipies for it on the web, so I thought I'd have a go. Basically you take unpasteurised full cream milk, and leave it to settle so the cream rises to the top. 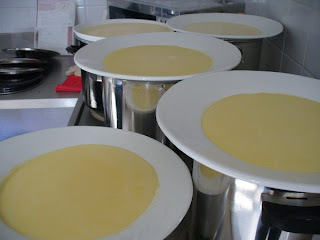 Then you heat it gently for an hour or so over steam to sterilise it, and the cream clots. Then you leave it to cool, and then scrape the clotted cream off the top. Did it work? Don't know yet, but it doesn't look like it made much cream! P.S. I have noticed that this page comes up when people search for sources of clotted cream in France. I have found that Mascarpone cheese, though different, makes a good substitute, and is widely available in France. 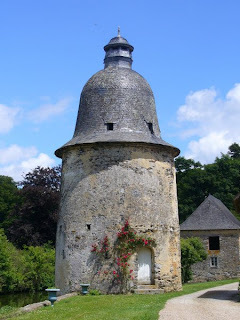 The Mayenne is a relatively little-known area of France, at least for Brits, it has to be said. 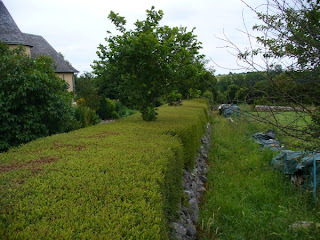 People have heard of Normandy and Brittany that lie between us and the channel, and of course they have heard of the more famous coastal holiday locations, the wine-producing areas, and the Loire Valley chateaux. But, generally, not the Mayenne. The Powers that Be are keen to attract more tourists to this area, but appear to be at a bit of a loss as to how to do it. Here is a page from a guide I picked up today in Laval, explaining the special features of an English-language guided tour of Laval's architecure through the centuries, that I will leave for you to read. 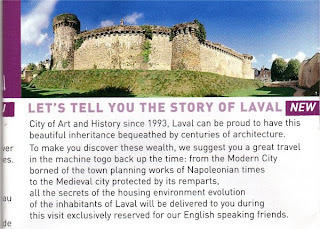 For my part it's clear to me from this brochure page, that if I went on this tour, I would understand perfectly everything that was told to me about Laval, and would come away with great cultural learnings of France for make benefit glorious nation of Britain. The lizards around my place tend to have short stumpy tails, or none at all, owing to the attentions of my cats. This one however has a good long one. It came to inspect my collection of flowerpot saucers yesterday. Careful inspection reveals that this lizard is quite tubby around the middle, so I suspect it is a pregnant female. 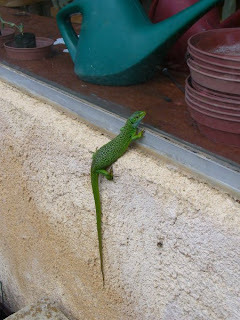 They are called "Green Lizards" in France ("Lézard Vert"), they lay eggs, eat slugs and snails, and live to about 8 years. 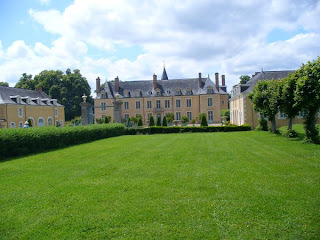 This château is not far from us, and is normally open to visitors for guided tours only in August. But a friend of the owner organised a tour for a group of people last weekend, and we were part of it. An interesting building, dating from the 12th Century when it comprised a moat surrounding 5 look-out towers and a small dwelling (a logis), with two further defensive towers at the drawbridge. Nowadays, one of the towers remains, and the rest of the space is given to a fine house. The house itself is very imposing, but is smaller than you might think. The building is only one room deep, in an "H" shape. Although the rooms have high ceilings, they are not especially large compared to what you might expect in a stately home in England. 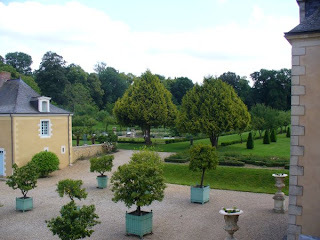 The owner keeps the tradition of putting out orange trees in tubs and overwintering them in an orangery. They are marmelade oranges, and they have the biggest marmelade production facility in West France. This is not saying much. 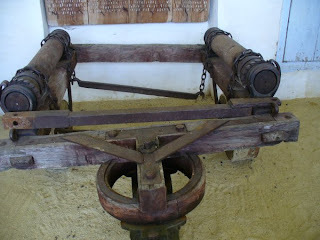 This is a device for carrying the orange tree tubs into and out of the orangery. 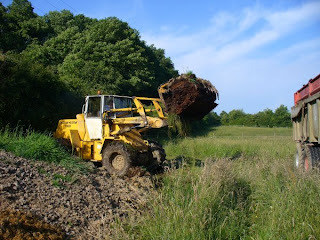 It has been replaced in use by a more efficient fork-lift truck, but is classed as a national monument so stays intact. This is Arabian Night. I bought a tuber a couple of years ago and took cuttings. So now I have a nice big patch of it. 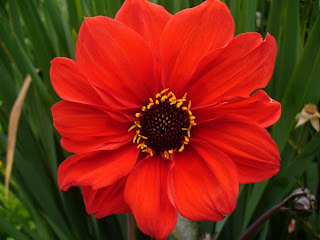 It will flower from now until the first frosts, as long as I remember to dead-head it. 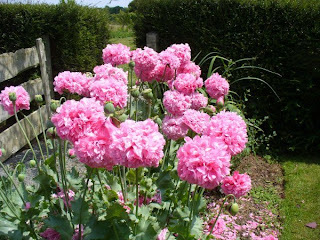 This one came from a packet of seeds entitled "Bishop's Children". 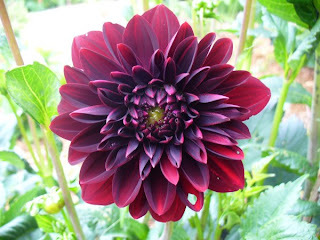 They made a variety of clolours and shapes, and this is one of several I kept and made some cuttings from this year. I think there is a variety called "The Bishop" and these therefore must be seeds from it. 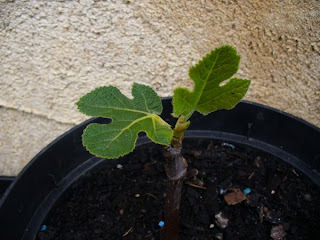 I was rather dismayed by the price of fig trees in the local garden centre, so I persuaded a friend who plays in the Harmonie to let me take cuttings from hers. This is one of three baby trees still not dead yet! Our local swin golf club had an open evening last night, to show off their new, improved course. They have spent a lot of time (and some money) on making the course more interesting, with improvements to the play and hazards around most of the holes. It was just a quiet event, 15 of us present, but we were entertained with a glass of wine and a buffet supper, accompanied by a video of the national championship competition that was held there not long ago. We also got to play a couple of holes of swin golf. The wife got down the course in little bunny hops, while I set off long powerful strokes that went the wrong way. And as we sat indoors with the other guests, eating our French sticks, salad and cold meats, the clouds cleared away and the sun came out. And a light mist rose up and eveloped the course. A nice evening. Before I moved to France, I thought that there was not much in the way of amateur music-making going on here. Wrong. 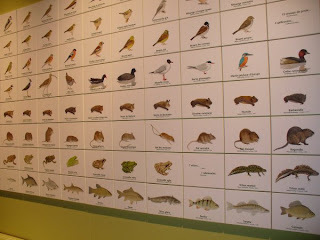 There's so much that it's all considered rather ordinary, so no-one really talks much about it. The only time when the band I play in, at St Suzanne, does any publicity, is when there is a concert going on. There's no need to advertise the regular Friday rehearsals, or to invite new musicians to come and play, because everyone knows: you just turn up. 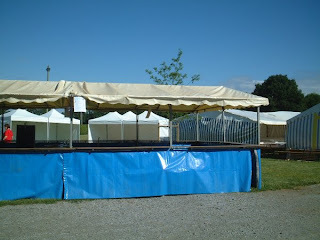 On Sunday we had a fête de musique; a whole afternoon and evening of free concerts, given by four different harmonie bands from Vallet, Brain Andard, Quelaines and Fontenay le Comte. In the evening we had the (professional) band of the French Navy at Brest. We, as the Harmonie of St Suzanne, hosted the event. The hall, holding upwards of 750 was full. 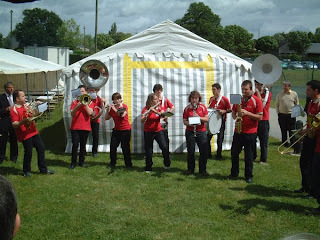 The bands presented fabulous concerts from film music, through classical, arrangements of pop songs, jazz, the lot. 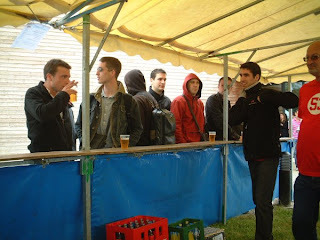 And in between, the barbeque, wine, beer, soft drinks. The weather was a bit variable, but luckily most of the showers were during the performances, when everyone was indoors listening, anyway. I think that military bands are often under-rated. But when your nation wants to greet and impress a senior foreign dignitary, your band had better be good. 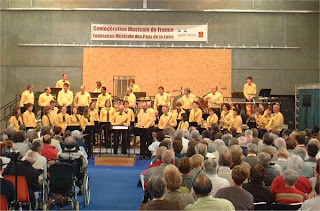 The "Musique des Equipages de la Flotte de Brest" are seriously good. Their concert was fantastic. ....especially as a place to shelter from the afternoon showers! Four different Harmonies played their individual concerts during the afternoon. 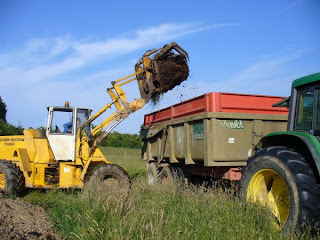 Today is the day for collecting the big pile of manure using the benefits of modern motorised automation. (See my eariler post for some background) So it's off early in the morning to arrive at 8:30 at the equipment shed, and then on to the field. Loading the truck was simple and efficient, the tractor, the trailer and the loader all got into the field (and out again) with no problems. 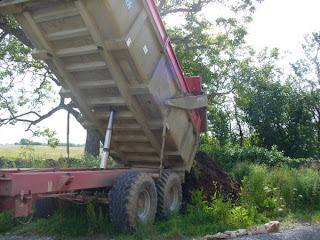 A bit tight perhaps through the gate, but OK.
And now I am the proud owner of the biggest heap of manure I have ever had. I do hope my plants appreciate the efforts I go to for them! 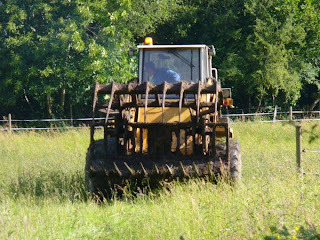 The loader looks vicious, but is quite tame really. Here he is, smiling for the camera.